Custom Photo ID Badges help create a secure workplace. Use our custom designer to create vertical or horizontal badges for your employees. Also get lanyards and holders. Add a professional touch to your desk at the office. We offer custom desk name plates in several sizes and color combinations. Full color UV printed plastic name tags with scratch resistant print and custom logo. Customize employee name tags in minutes and add magnets for easy wear! For a more traditional look, checkout our engraved name tags. Choose from over 25 colors and add your company logo for a unique look. 1. 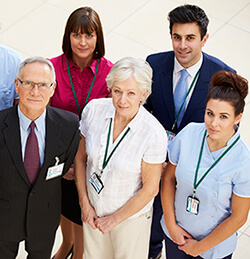 Company branding is one of the primary advantages of requiring employees to wear name badges. Not only do custom logo name tags promote your business, but they also create unity and a cohesive aesthetic. Full color magnetic name tags give businesses the chance to feature logos and branding so each employee is outfitted as a company representative with every customer interaction. To branding even further, custom name plates can be ordered to feature company logos, staff names and job titles. 2. Name Tags can often mean the difference between a sale and a missed opportunity. Make sure your staff is easily identifiable with quality custom name badges. Whether you are running a hair salon, coffee shop or law firm, name tags create community within your office or store, and initiate communication between staff and customers. Name Tag Wizard makes it fast and easy to order name badges for your full staff. Using our “Design Wizard” you can choose name tag sizes, shapes, text color, backing options, upload company logos or images and upload a list of names. Identify every member of your team with name badges that state each person’s name and job position to ensure they make the right impression with your desired customer. You can even find reusable name tags for conferences and events! 3. Personalized name badges increase productivity by connecting names with faces. This can often be done with simple text only name badges. If you are looking to order a text name tag for each of your employees, or for yourself, we offer fast UV printing and a few simple templates that you can update with one, two or three lines of text. Plastic full color name tags can be UV printed with up to 4 lines of personalized text. To create fun, themed badges for your business, see our quality pre-designed templates featuring church, school, real estate and dentist office badges. 4. Photo ID badges help increase security. Many industries require photo IDs, and they are particularly popular in work places that deal with sensitive data, handle costly equipment and sell expensive merchandise. Large corporations that employ hundreds or thousands of staff members also benefit from custom IDs, because they make it easy to identify who belongs on business grounds and who does not. If you are looking for increased security in your business, custom photo IDs are available with full color images and customizable bar codes. Name Tag Wizard offers several popular photo ID templates featuring vertical and horizontal layouts that can be customized with your employees’ pictures, job positions, company name and logo. You can also choose quality double sided picture ID cards. We print your ID cards and ship them to you completely ready to use. There is no software to download or finishing touches you have to add. 5. Executive badges can help clients and fellow employees identify top company officials. Premium name tags with holders feature a clean and professional look for executives and top members of your staff. When intraoffice communication is better, business is also often improved due to an increased sense of trust and community. Oval and rectangle beveled name badges are available with custom text, logos and with silver or gold holder styles. Choose from white, gold or silver. Accessories and backing options for framed name tags include swivel clips, magnets, pins and mylar. Each industry has unique demands. If your staff works in an industrial setting, aluminum name tags provide a lasting option for employee identification. 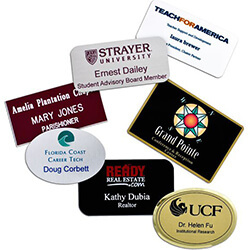 Name Tag Wizard offers quality UV printing and sublimation on silver and brushed gold metal name tags. If your business requires travel, remember to mark your bags with custom luggage tags so that they are easy to identify in the baggage claim area. Business travel is often hurried or last minute, and luggage tags can alleviate some of the stress associated with air travel. Name Tag Wizard offers quality engraving on metal luggage tags. When it comes to increasing safety and productivity, we have your needs covered. Also see our custom signs featuring front desk and receptionist desk plates that should be a part of any business.